The small country of Denmark (pop. 5.6 million) is making a big commitment to renewables. In the early 1970s imported oil supplied 92 percent of Denmark’s energy. 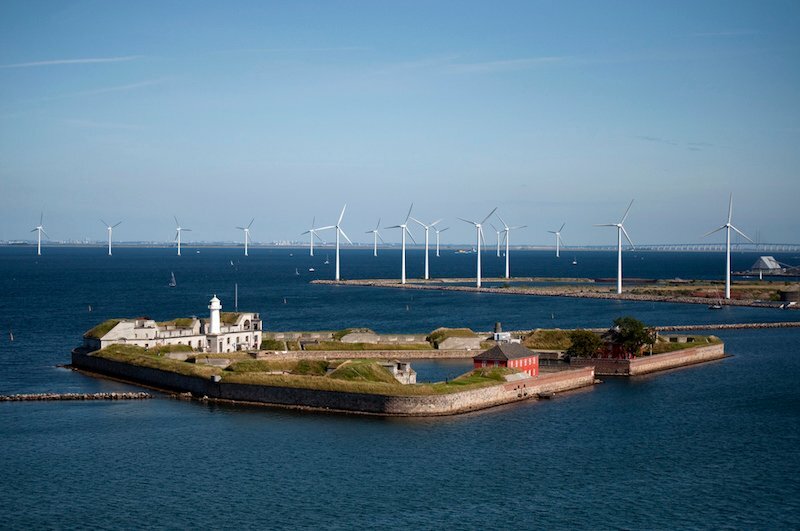 Today Denmark’s electric grid is over 40 percent renewably powered, and the country is aiming to reach 100 percent renewable electricity by 2035 and 100 percent renewable energy in all sectors by 2050. Denmark also plans to reduce its domestic greenhouse gas emissions by 40 percent by 2020 relative to 1990 levels–without the use of carbon credits—ten years ahead of the proposed EU target. Denmark is fortunate to have extremely good wind speeds—averaging 7.6 meters per second (California’s Altamont Pass wind farm sees 5.3 to 7.1 m/s, and power output rises as the cube of windspeed). The country has a goal for windpower to supply 50 percent of electricity consumption by 2020, and it is well on its way. In 2015, wind power supplied 42 percent of domestic electricity consumption. Denmark was the first country in the world to build massive offshore wind farms, installing a 5 MW wind farm two kilometers from the coastline in 1991. Since then the country has installed four other offshore wind farms bringing offshore wind capacity to 1,271 MW. The country also has over 300 onshore wind turbines bringing total wind capacity as of January 1, 2016 to 5,070 MW. To reach its goal of 50 percent wind power by 2020, the country has an initiative to deploy an additional 1,000 MW of offshore and 500 more MW of nearshore wind turbines, as well as to replace old onshore wind turbines with new higher-capacity ones. In order to avoid any potential local opposition to the onshore wind farm, the Danish government implemented various regulations to help with public acceptance. For example, residents are compensated if a property loses value due to wind turbines, the local community receives a payment per megawatt-hour of power generated, and at least 20 percent of the shares in a wind farm must be offered to local residents. In fact, Denmark is one of the most energy-efficient countries in the EU and the OECD, partly because many Danish companies have optimized their industrial processes, facilities, and equipment. Denmark’s goal is to reduce its final energy consumption by 7 percent in 2020 compared to 2010. The different energy sectors in Denmark—oil, electricity, natural gas, and district heating—are each assigned a share of energy savings to reach depending on their market share. The trade associations for those sectors then delegate responsibility for those savings to its member companies, also based on market share. The country also quadrupled new buildings’ thermal efficiency from 1977, and forbade oil- and gas-fired heating of new buildings from 2013. Denmark is also a leader in combined heat and power (CHP). Twelve percent of all power in Denmark is generated from biomass and organic waste in CHP plants, and more than 80 percent of Danish district heating is cogenerated with electricity. Today, there are 670 decentralized CHP plants around the country. Most of the biomass being used in Denmark today is from straw and biodegradable waste, and 30 percent is imported from Eastern European countries and Canada in the form of wood pellets and wood chips. Biomass proponents claim that burning wood pellets is a carbon-neutral form of energy because the plants that are the source of biomass capture as much CO2 when growing as they emit when burned. However, many others believe harvesting wood for biomass is anything but carbon-neutral and threatens many diverse ecosystems throughout the world. In December 2014, the Danish Ministry of Climate, Energy, and Building announced that only sustainably produced biomass would be purchased. The agreement includes requirements for the entire biomass supply chain and requires that forests that supply biomass for energy production be replanted. However, the debate continues, as some argue that planting is no guarantee of healthy maturation—about as much biomass belowground must also be protected in its volume and biodiversity, and although the biomass may be sustainably produced, the magnitude of the biomass material harvested may be unsustainable. Denmark’s CHP plants, in combination with the wind turbines, make Denmark one of the countries with the highest percentage of distributed generation in the world. In 1990, the country had 15 central power plants. It now has 20 central power stations (4,200 MW), 45 electric boilers (550 MW), 5,300 wind turbines (5,070 MW), and 94,000 solar PV panels (785 MW), in addition to the 670 local combined heat and power plants (2,300 MW). While the variability of wind power can be challenging, one advantage Denmark has is its proximity to other countries to which it can export wind power. When Denmark has an excess of wind power, as happened last July when the country’s wind turbines produced 140 percent of the electricity demand, it exports electricity to Sweden, Norway, and Germany. Sweden and Norway import the electricity to save water in their hydro reservoirs, and use their hydropower during periods of low wind. Germany uses German windpower to save coal, though Germany’s own renewables are so robust that with their legal (and economically rational) dispatch priority, they often limit Denmark’s ability to export to Germany. Denmark is also looking into establishing new connections to farther countries such as Holland and England. Denmark is hoping to build a smart grid, and embarked on a full-scale smart grid pilot project in 2005, by reorganizing its grid in a cellular architecture. The Cell Controller Pilot Project (CCPP), which lasted for seven years, used advanced computers to jointly control wind turbines, CHP plants, and other distributed generation sources in a 1,000 square kilometer region, making them operate as a single integrated virtual power plant that can intelligently ramp production up or down depending on wind conditions and power consumption. This not only helps with grid reliability, but also provides ancillary services such as power balancing, import and export of power, and voltage control. A study conducted by Energinet showed that implementing a smart grid would provide gross socioeconomic benefits of $1.2 billion. Most importantly, Danish grid operators, who 15 years ago would have considered it impossible to run the grid stably with three-fifths renewable supply, now achieve this routinely. They have become among the world’s most adept at integrating diverse, distributed, often variable, renewable resources. As a result, Danish electricity supply is the most reliable in Europe, slightly ahead of Germany’s, and about ten times more reliable than U.S. electricity supply. Being fossil fuel free by 2050 means a big change in transportation. Yet Denmark has already made great strides. To discourage gasoline consumption, Denmark has a 180 percent tax on new cars, waived if one buys an electric car; a 95 percent surtax on cars weighing over two tonnes; and an annual tax on cars’ inefficiency. There is also free parking for EVs in all cities. 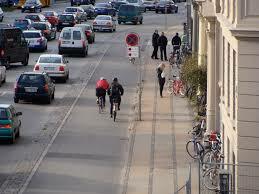 It is estimated there are more than 4 million bicycles in Denmark and more than 10,000 kilometers of separated bike paths and bike lanes. And one-third of all commutes to work and school are done by bicycle. Biomass scenario: CHP for electricity and district heating. Bio+ scenario: Replacing coal, oil, and natural gas with bioenergy. Wind energy remains at 2020 level (50 percent of electricity). Hydrogen scenario: Highest wind deployment of any scenario along with hydrogen production. But the main conclusion of the Danish Energy Agency’s report is that it is technically feasible for the Danish energy system to be 100 percent fossil fuel free. And it’s well on its way.